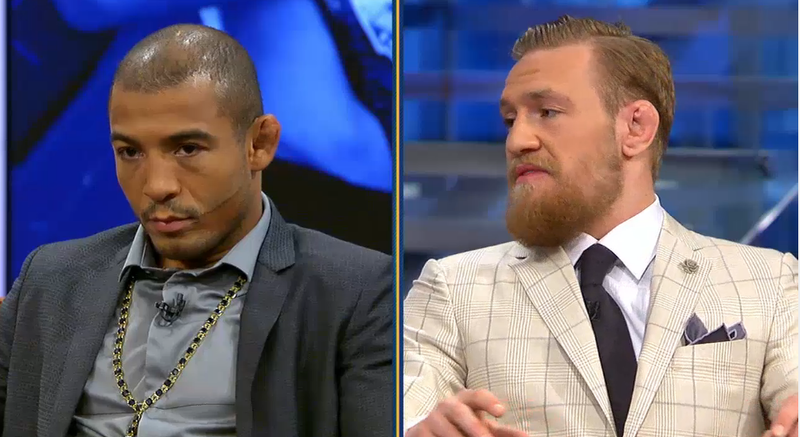 Jose Aldo calls out Conor McGregor for rematch after UFC 229: "There's nowhere to run"
This past Saturday at UFC 229, it was one of the roughest nights of Conor McGregor’s MMA career. Not only was his UFC return an absolute fail as he was submitted in the fourth round of his UFC lightweight title fight with Khabib Nurmagomedov, but shortly thereafter he was part of an outrageous brawl between both camps. But now, as if he doesn’t already have enough to deal with, another one of McGregor’s old foes is calling for a rematch with him. This foe, is one he was able to take out fairly quick in December of 2016. His name, former long time UFC featherweight champion Jose Aldo. Approximately 48 hours after the insanity that was the UFC lightweight title fight had ended, the Brazilian banger immediately took to his social media to request a rematch against his Irish arch nemesis. When speaking to Brazilian MMA media, Aldo stated he was willing to jump to 155 pounds and compete at UFC 231, where Max Holloway will finally face Brian Ortega for the UFC featherweight championship. Despite Aldo’s challenge to McGregor for a second encounter, McGregor is already lobbying on his social media for a rematch with Khabib Nurmagomedov.